Performed in a former Greenwich Village speakeasy, The Imbible: A Spirited History of Drinking is an entertaining performance piece that takes a crowd of eager-to-sip New Yorkers and savvy out-of-towners on a musical tour of the history of alcohol. The brainchild of engaging, tuneful, and slightly hyperactive mixologist and barbershop quartet singer Anthony Caporale, The Imbible starts out in prehistoric times – where a pile of harvested wheat doused by rain is recovered soaked in a bubbly, happy-making brew – the first beer! Anthony takes a scientific approach and enlightens the crowd that alcohol had tremendous medicinal value before it was drunk for a good time, telling us that cavemen that drank beer were not only happier but just happened to live longer thanks to alcohol’s antiseptic qualities. We go from the cave dwellers to Egyptians and beyond, and as the millennia turn, the quartet of actors (two boys, two girls) make numerous quick costume changes all while singing in four part harmony, and, on three occasions, handing out historically appropriate cocktails. To celebrate the birth of beer, we enjoyed mighty tasty Shandies (Coney Island brewery's Overpass IPA mixed with gingerale). Then when we traveled across the sea with the East India Company, we learned that Brits stationed in India mixed their malaria prevention (quinine-containing tonic) with their daily gin rations. As we drank a very limey and refreshing gin and tonic we newly appreciated this summer standard for its medicinal qualities. For me, I felt like I was back in class at the Wine and Spirits Education Trust (WSET), when Anthony placed a ridiculously adorable miniature copper pot still on the bar and rasped lyrical about distillation and the heads and tails. Sigh, good old WSET was never such fun. And after learning how whiskey was made, we got to enjoy a Ginger-Orange Old Fashioned, which was a drink that became popular after Prohibition, because it was made the “old fashioned” way – in other words, not with nearly-toxic bathtub gin! Anthony and his merry band sang, mugged, served, and cheerfully presented about 10,000 years of booze history in a breezy hour and a half. 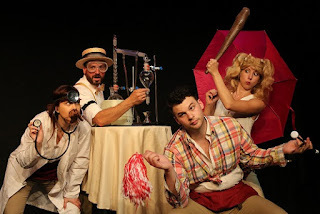 For those who appreciate theater, barbershop quartet music, and the chance to think (a little) as they drink, The Imbible makes a great evening out. 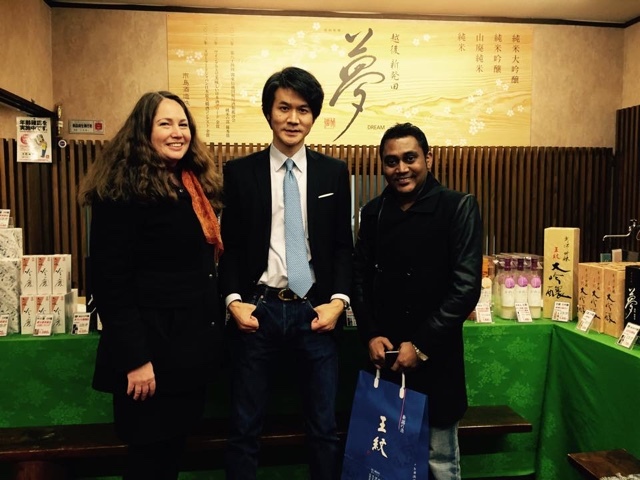 The Ichishima Sake Brewery http://www.ichishima.jp/eng/ in Niigata, Japan is the perfect destination for English-only speakers who want to enjoy the unique experience of seeing where sake is made first hand. For tourists familiar with winery visits, perhaps from trips to northern California or Long Island’s North Fork, a very different experience awaits. First of all, unlike the picturesque Napa winery with faux-Spanish stucco enveloped in ivy and surrounded by vines, in Japan many sake breweries are in the middle of thickly populated cities or large towns. The rice fields are many miles away and definitely not part of the tour. The equipment you’ll view in a sake brewery is also unique to this beverage, which has been a traditional favorite in Japan for more than 1000 years. At Ichishima Brewery, you can view well-preserved displays of old sake-making devices and sample their various styles of sake. I was extremely fortunate to have the opportunity to share the day with seventh generation owner, Kenji Ichishima. Kenji speaks perfect English and he was a wonderful guide for me as well as Ravi Mahabeer, a sommelier from Doha who just happened to be in town. Our multi-course lunch with a variety of fresh fish, shell fish, noodle dishes, soups, and more was a stunning example of kaiseki, or gourmet style Japanese cuisine. He poured us sake from huge saucers, which stack from largest to smallest - largest being reserved for most honored guests. This is an old custom that was fun to experience, although drinking from a dinner-plate sized saucer is something of a challenge. As we ate the wonderful lunch, we could see the snowy garden, where stone statues were softly rounded by the white cover. Our full day had included a full tour of the contemporary sake making facility, where I was most interested to see the koji room - this is a warm, sterile room of wood walls, where rice is sprinkled with the fungus that needs to grow as an important part of the sake making process. We also got to try sake at various stages in the fermentation process. Sake is only brewed during the winter - so if you want to visit a brewery, it needs to be during the cold months. 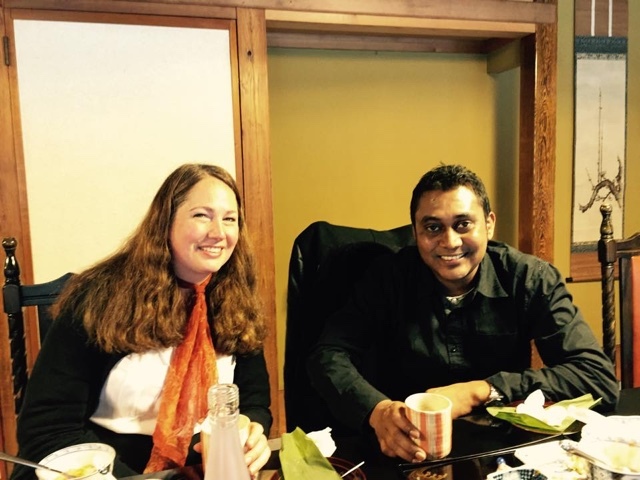 I am at the begininning of what I hope will be a lifetime journey of learning about this ancient Japanese beverage. If you are in Japan, I encourage you to try sake, and if you want to plan a fun day trip from Tokyo, hop on the bullet train to Niigata to visit the Ichishima Sake Brewery. 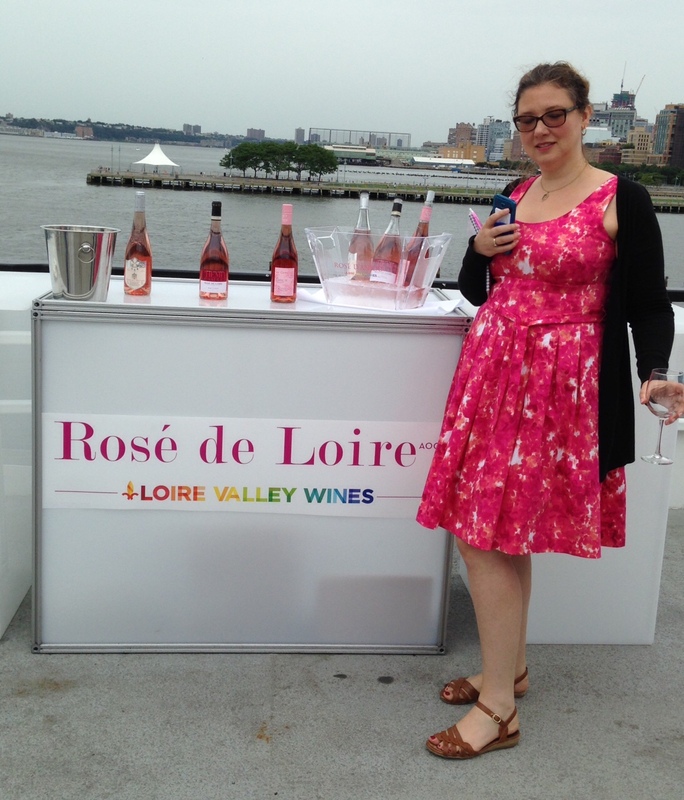 This year La Nuit en Rose was aboard the beautiful Hornblower Infinity Yacht, which sailed from Pier 15 near South Street Seaport onto the Hudson and East Rivers. This year’s sold out event, which bills itself as “The World’s First Rose Wine Festival,” was a wonderful showcase of what seems to be everyone’s go-to summer style of wine. In fact, the Infinity was packed stern to bow with rose wines from all over the world – France, Spain, United States, South Africa and more. There is not a more fun way to sample the many styles, colors, and flavors of rose wine than at this annual event. The event included delicious food, including melt-in-your-mouth croque monsieurs, rich cheeses, an olive bar, and -- in the VIP area -- mountains of shrimp cocktail and tiered displays of petit fours. An informational booklet at the event explained some cool facts about rose, and included a world map that pinpointed where it is consumed the most. No surprise to anyone who’s been to the Hamptons that it’s the U.S.! France is the largest producer of rose wine, followed by Italy and the U.S. So, who comes out for a full-rose event? There was an elegant crowd, many of whom got into the spirit by dressing in every shade of pink imaginable. 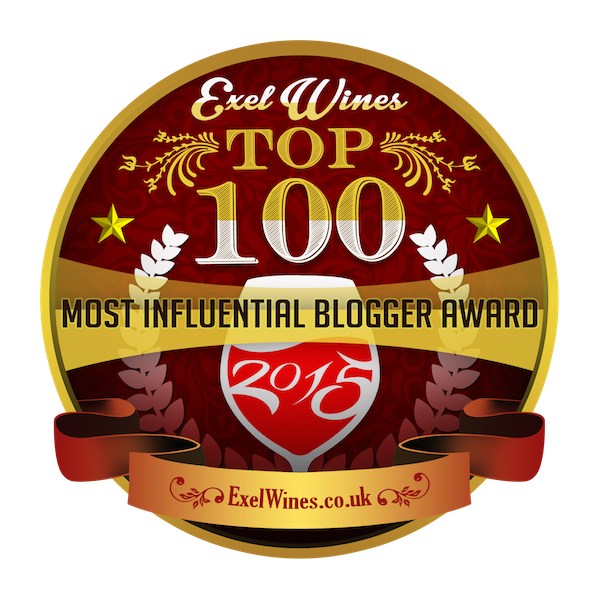 The event received major sponsorship from Wine Enthusiast, and copies of their latest issue were available to attendees. I met Dr. José Vouillamoz at lunch...in the Republic of Georgia. An international gathering of wine professionals sat in the autumn sunshine eating roasted meats and drinking Rkatsiteli fermented in qvevri. When I turned to make conversation with my table mate, he modestly revealed he was working on a book with the tremendous ambition of cataloguing the world’s grapes under production. “Wow!” was all I could muster. Three years later, I got to know José much better at the Digital Wine Communications Conference in Montreux, Switzerland. 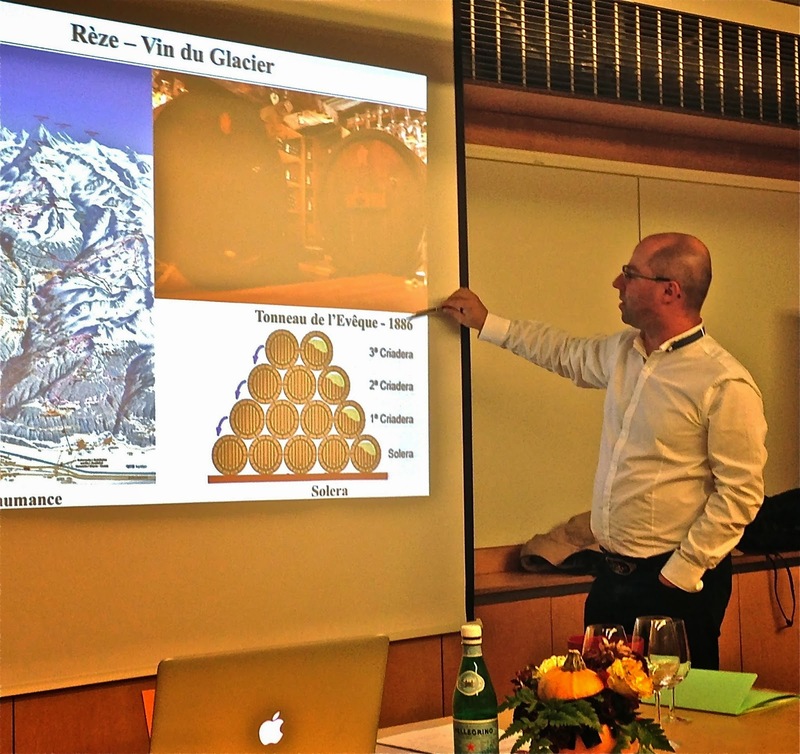 There I learned that Swiss wines are not just of academic interest to José – they are a personal passion and a birthright, as he was born in the rugged mountains we would soon explore. Tasting with José at the conference was educational, but only when our press trip took to the countryside did we see, smell, and taste the wonder of the Valais. This is Switzerland’s largest wine region where wine grapes are harvested more than 1000 meters high. We spent three days steeped in this alpine wine culture and tasted rare wine varities including Arvine, Amigne, Cornalin, Rèze, and more. Our first stop was an exceptional mountain vineyard. Our bus couldn’t descend the terraced slopes, so we walked. There is nothing like walking through the Swiss Alps. The air has an almost heartbreaking sweetness. Your spirits raise as you advance on soft dirt paths lined by lush green grass where small cows graze, their bells ringing “bom bom” as they walk. We zig-zagged down a rocky slope that had vineyards cutting across its face. We concentrated on our balance as we snapped photos of magnificent vistas and repeatedly stopped in awe. This vineyard was as incredible for its remote location and height as its beauty. At a slight flattening in the ground, lunch and a tasting had been prepared. 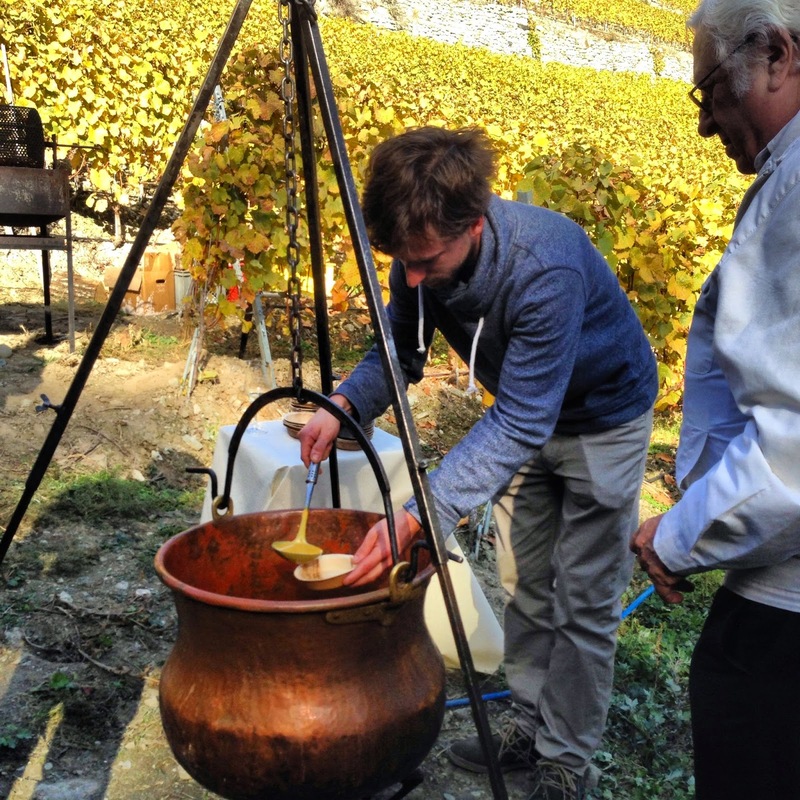 Pumpkin soup from a brass cauldron, and a world of savory Swiss cheeses and dried meats awaited us. We were spoiled with a fine selection of white wine, including sweet and dry Amigne and Arvine, and red wine including Humagne Rouge and a range of savory, bold Syrahs. 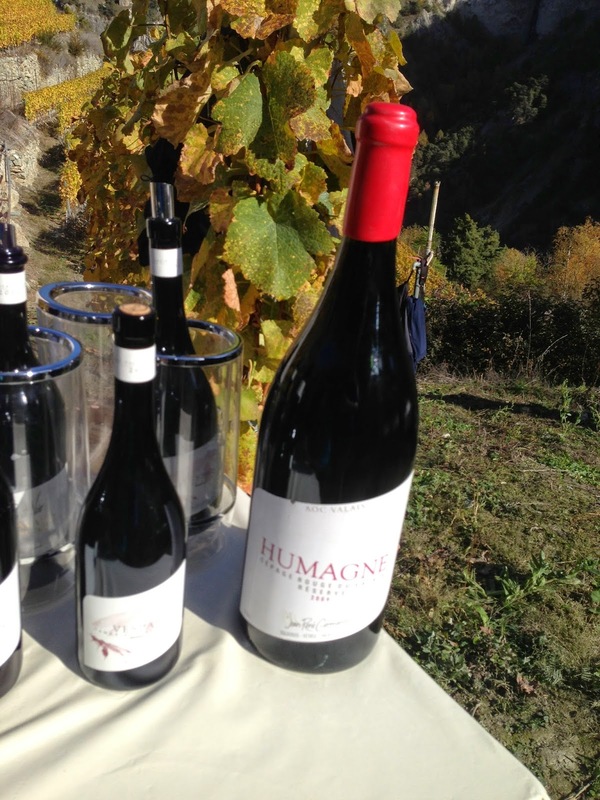 The wines were from the recently restored vineyards of Jean-René Germanier, whose wines have been recognized as among the best in Switzerland. He and enologist and co-owner Gilles Bess have devoted efforts to native varieties and working with the unique terroir of the Valais. Afterwards, we hiked back up and hit the road again to visit Clos de Tsampéhro. Their Extra Brut was a refreshing sparkling wine blended from Petite Arvine, Pinot Noir, and Chardonnay. When we moved to the still wines, we sampled wines made from varieties most of us had never tried, including the red grape Cornalin (more properly called Rouge du Pays per José’s studies) and Rèze. Cornalin is considered the “local lord” and Rèze used to cover the valley in the pre-phylloxera days. The day concluded with a memorable visit to the Sensorama at Chateau de Villa in the village of Sierre for a truly exceptional tasting: Impossible Valais, in which José shared treasures from his personal wine collection. All joking ceased as we took our seats in a beautiful, modern tasting space: we were humbled and honored at the wine we were about to taste. Orsat Arvine Primus Classicus 1988 – This white had apricots and ripe peach flavors with even some racy grapefruit notes. It was silky and had a gorgeous richness, but, somewhat paradoxically, also a refreshing acidity. Provins Amigne 1967 – This funky wine had mushroom and scones on the nose and high acidity still. José told us this grape was first mentioned in 1686 and this rare variety is only planted on 42 hectares in the entire world. Orsat Johannisberg St-Théodule 1955 – This white made from the Silvaner grape had a fresh, inviting nose, with scones and currents. 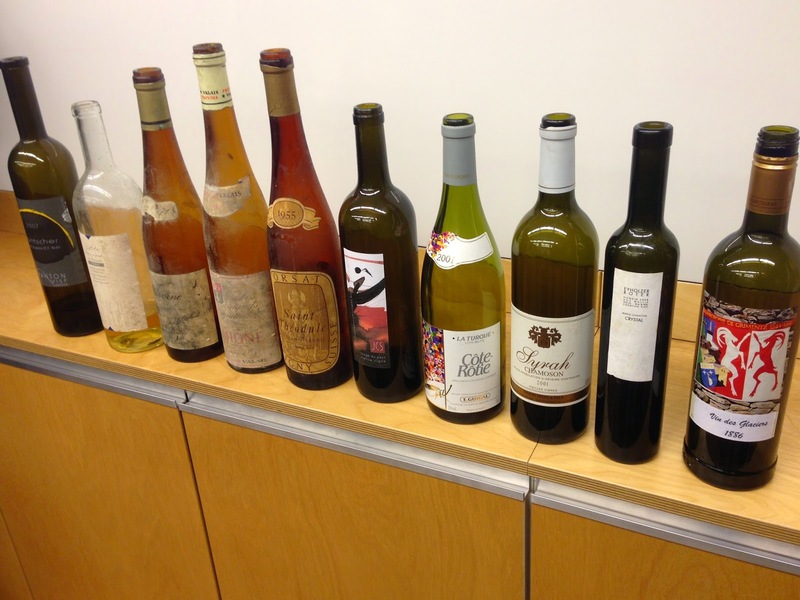 On the palate, I found yellow raisins, quince paste, marmalade, lemon cream, and pumpkin. José told us that 1955 was the vintage of the century for Valais. It was at that point, we began to question, only half-jokingly to ourselves – were we even worthy of these wines? Stéfano Délitroz Rouge du Pays 2011 – fast forward to the present, we had a beautiful red. There was smoky bacon on the nose and palate, and deep blackberry flavors. The acidity, fruit, and alcohol were in balance. I loved this deeply concentrated wine, which was like a meal in a glass. We learned that this wine came from 80 year old vines, a special parcel owned by two people who knew how great these vines were – José and Stéfano Délitroz. Bourgeoisie de Grimentz Vin du Glacier 1886 Solera – This wine was made from Rèze. If the tasting had not already earned its name, “impossible,” it certainly did with this wine. The wine had been topped up over the years, with the base wine dating back to 1886. 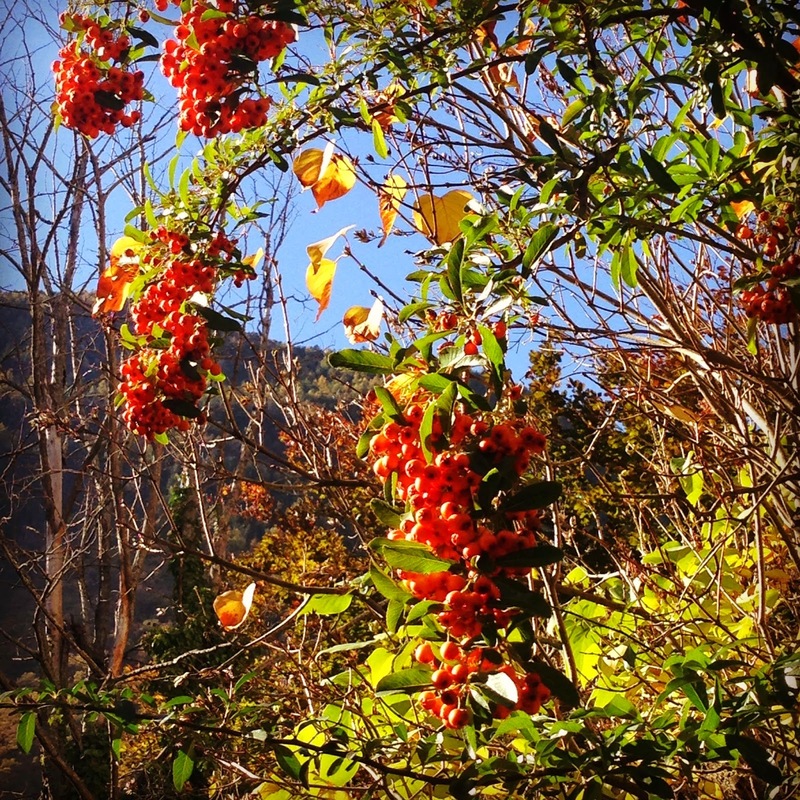 It is from the village of Grimentz, and it is only ever available by making the journey to the wine cellar. José had to convince them to let our group try the wine. They agreed on the condition that we would tell the story. There are only 20 liters of this wine in the barrel known as Tonneau de l’Eveque or the Bishop’s Tonneau (large format barrel). The wine was deep in color and had a sherry-like flavor with almonds and hazelnuts. Savory, with a finish that seemed to never stop, we all agreed we had never tasted anything quite like it. There were many times for laughing on the trip and there were times when the normally ebullient José would say, “Now, we are serious.” Tasting this wine was not just serious, it was a reverent moment that would never be repeated-- all of us in Switzerland, tasting these amazing wines together. We also were treated to an unforgettable authentic Swiss alpine meal at Restaurant Chateau de Villa, the “Temple of Raclette” where we indulged in plate after plate of melted cheeses accompanied by smoked meats, small potatoes, pickles, and breads. As we traveled with José across breathtaking mountain passes, his smile and generosity never failed him, all while teaching us so much about the heritage and history of these grapes (making me eager to add his Wine Grapes book to my personal collection, as I understood first hand his brilliant grasp of the subject.) 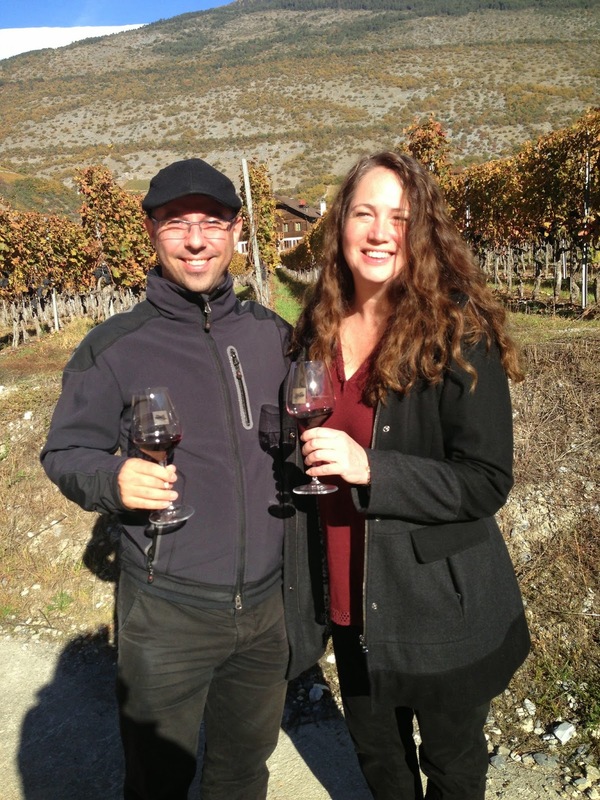 To sip wine, eat Raclette, and meet winemakers with him was an experience I will always treasure. José’s favorite expression as he led us through mountain vineyards and village wine cellars was “We are young, we are beautiful and we love each other.” José’s knowledge of grapes’ heritage vastly enriched our understanding of Swiss wines - and his friendship vastly enriched our lives.